Business management professionals are the people who get things done. They oversee the performance of teams and operations to maximise a company’s potential for profit. To achieve this they need to be skilled in all areas of business including sales and marketing, accounting and finance, human resources, communication and negotiation, logistics, legal issues and leadership. Every organisation in every industry requires management professionals. This makes Business Management one of the most versatile and rewarding careers available to you. The ICMS Bachelor of Business Management is highly regarded by the professional services industry. Your Business Management degree at ICMS is a well-rounded qualification with opportunities for in-depth study in a professional services sector of your choice. Your core subjects are supplemented with business electives or specialist industry electives in a range of study areas. The ICMS Bachelor of Business Management is developed and continually updated by industry professionals including business managers, specialist managers, and retail and service professionals. This ensures that degree content is constantly relevant to the needs of industry. You will gain specialist knowledge in business management and be trained to work in an international environment. When you graduate from ICMS you’ll have more than just a degree. Built into your qualification is 1,200 hours (9 months) of industry experience. Our industry training consultants will help place you in an organisation relevant to your studies so that after your degree you’ll have an impressive CV, a network of contacts and a significant advantage over other graduates. Theory is important; it will teach you the fundamentals you need to be a business management leader. But nothing is as valuable as putting theory into practice. In addition to your industry training, you’ll gain hands-on experience through practical classes. Field trips and site visits with our industry partners will get you learning about business operations and management issues from the best in the business. This degree is far more than a business training program. You will combine general business subjects with a range of subjects from business categories, training you in the critical and analytical skills you’ll need to move into management when you graduate. At ICMS we have lecturers with international careers and extraordinary business expertise. 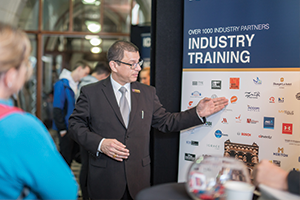 Guest lectures from our network of industry partners will keep your learning fresh and relevant and up to date with the latest demands from industry and your future employers. At ICMS we train you to be a leader in business management. When you graduate with an ICMS Bachelor of Business Management you will have transferable skills, industry experience, and in-depth knowledge of business management principles in practice. This will see you ready for a career that spans industries and continents. You can work in a multinational company locally or take your new found skills and experience around the world. You can choose to specialise in one of three highly sought after areas of industry. Your chosen subject will appear on your academic transcript when you graduate. Alternatively, you can choose to study a range of subjects across the spectrum of business electives. Entrepreneurs are made, not born. You can develop the tools and the skills to become an economic innovator, to think creatively, and to balance opportunity against risk. In Entrepreneurship you will learn to identify and exploit business opportunities and manage business growth. You will learn how to build, promote, and manage your own businesses by understanding processes used by start-ups and rapid growth small firms to large corporations and non-profits. As groups share, sell, and swap goods and information via the digital world, there are new opportunities and challenges for marketers. New media has seen a power shift in the way consumers and retailers relate. With a greater public voice, consumers are taking a more active role in their purchase decisions. Any business involved in marketing requires the tools, tactics, strategies, and processes needed to create, track, and manage new media. Learn to make the technology work for you with integrated traditional and digital marketing communication strategies. Retail marketing is a dynamic business. Technological, economic and social change influences consumer behaviour. Retail marketers must continually employ new tactics and strategies to secure sales and generate consumer loyalty. Retail marketing at ICMS has been developed in partnership with leading industry professionals. It examines consumer behaviour, retail technology, advertising, e-commerce, social media, buying and logistics, and visual merchandising. Retail growth is critical to the global economy, and to the sustainability of every retail business. Retail marketing is ideal for careers in marketing, merchandising, store management, buying, management or logistics management. We have an impressive network of industry partners. These leading companies provide our ICMS community with invaluable industry insight and experience. When it is time to embark on your industry training, we work closely with them to find a suitable placement that is the best fit for your skills, interests and professional goals. Your industry training could take you to a major city, regional area or regional area in Australia. You could even take up a position in an international city. It is all part of finding the best placement for you. Not only is this an invaluable experience, it is also a chance to grow your professional network. For many of our graduates this experience introduces them to their future employers. Successful and satisfying careers don’t just happen. Learn the concepts, techniques, tools, and processes to plan and implement the career you want. With an emphasis on linking theoretical and empirical research with practical lifelong skill development, you will learn the best career management strategies for your work style, interests and personality. Project managers use limited resources to effectively and efficiently produce the best project deliverables without compromising scope, budget, schedule or quality. It involves planning, executing, controlling and closing the project. You will learn the essential principles, concepts and processes of project management to confidently use your skills in practice in any business environment. The consumer experience can make or break a company. You will learn the effective methods that organisations use to measure, monitor and improve the quality of their services and products. Whether you work in customer service or own your own business, quality management and customer service strategies are critical to your professional success. "I wanted to study business and hospitality, and after extensive research discovering Australia’s top institutions providing this, I chose ICMS. "My ICMS degree gave me great foundations for a career in business, preparing me to succeed both academically and professionally in the high-performance world of consumer and enterprise technology. Course length: 2 years and 2 trimesters (2.75 years), may be longer depending on subjects selected. Includes up to 9 months of industry training which equates to a minimum of 1200 hours.